Sgt. 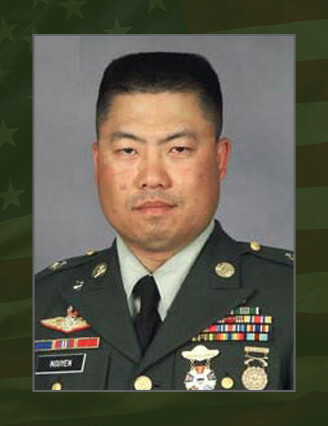 1st Class Tung M. Nguyen, 38, a Special Forces communications sergeant assigned to 2nd Battalion, 3rd Special Forces Group at Fort Bragg, died Nov. 14, 2006, as a result of a gunshot wound during combat operations in Baghdad. Nguyen was born in Cantho, Vietnam, became a U.S. citizen, and was raised in Tracy, Calif. He enlisted as an infantryman in 1986. His first assignment was with Company A, 4th Bn., 22d Infantry Regiment, 25th Infantry Division (Light) at Schofield Barracks, Hawaii where he served for three years. He then left active duty and served with the Army Reserve in Sacramento, Calif. In 1991, he reentered active duty, and served with 1st Bn., 187th Infantry Regiment, 101st Airborne Division (Air Assault) at Fort Campbell, Ky., for one year before volunteering for Special Forces training. Nguyen began his journey to become a Special Forces Soldier in 1992 and earned the coveted Green Beret when he graduated from the course in 1993. He was assigned to 1st Special Forces Group, Fort Lewis, Wash., that year and served in all three combat battalions during his tenure there, first as a communications sergeant and then as an intelligence sergeant. In 2003, Nguyen was chosen to become an instructor at the U.S. Army John F. Kennedy Special Warfare Center and School. He served in both instructor and operations positions, preparing Special Forces Soldiers for the rigors of combat, until February 2006 when he was assigned 3rd SFG where he served until his death. Nguyen’s military education also includes the Special Operations and Target Interdiction Course, Special Forces Advanced Reconnaissance, Target Analysis and Exploitation Techniques Course, Warrior Leaders Course, Nuclear Hazards Training Course, Basic Airborne Course, Air Assault Course, Basic and Anti-Terrorism Instructor Courses, Basic and Advanced Noncommissioned Officer Courses and Combat Lifesaver Course. His awards and decorations include two Meritorious Service Medals, two Army Commendation Medals, four Army Achievement Medals, six Army Good Conduct Medals, two National Defense Service Medals, Global War on Terrorism Expeditionary Medal, Global War on Terrorism Service Medal, Armed Forces Reserve Medal, Noncommissioned Officer Professional Development Ribbon, Overseas Ribbon, Army Service Ribbon, Parachutist Badge, Air Assault Badge, Distinguished Pistol Shot Badge, and the Special Forces Tab. He was posthumously awarded the Bronze Star Medal, Purple Heart, Iraq Campaign Medal, and Combat Infantryman Badge. He also was the winner of the 2006 Small Arms Championship Sniper Class competition, and the 2006 Joint Special Operations Command Small Arms Championship Pistol Class competition. Nguyen is survived by his wife, Marcia of Raeford, N.C. He is also survived by his parents, Nguyen Van Tuan and Phan Cong Duc of Alameda, Calif.